Barbepeste Official Orchestra : Bootleggers. Ahoy and shiver your timbers to some irish world music with a smattering of pirates. Most of the themes developed in this album come from Ireland, but the band explores a broad spectrum of melodic and rhythmical instruments, from all over the world. The diversity of their instrumentarium allows arrangements that give a new and colorful version of those themes. And so we travel from Ireland to India, via Spain, Sweden, Maghreb or Caribbean; we go from Baroque to Rock, from intimate sounds to more festive ambiances. A musical journey, towards space and time! 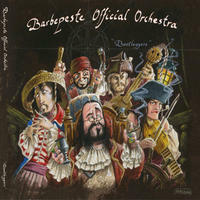 Embark with the Barbepeste Official Orchestra! License Ahoy and shiver your timbers to some irish world music with a smattering of pirates by Barbepeste Official Orchestra for your project. Play the music of Barbepeste Official Orchestra in your restaurant or store.